I Am Setsuna review: "Obtuse combat and monotonous pacing keep it from reaching lofty heights." I Am Setsuna is out this week for Nintendo Switch. Here is our review from its initial release on PS4. I Am Setsuna knows what it wants to be, and it tries its hardest to achieve it. It's a smaller, more intimate adventure than many of Square Enix's prior efforts, attempting to exist somewhere between its 8-bit progenitors and the flashy, multi-million dollar productions of its Final Fantasy brethren. In some ways, its somber, snow-filled tale evokes genuine emotion along with its decidedly old-school sensibilities, coming close to providing the same feelings as the games it attempts to ape. Unfortunately, the game surrounding its story is kind of a mess, undercutting its potential whenever it gets a chance. The thing that I Am Setsuna is best at doing is capturing a specific mood - in this case, sorrow. You're introduced to Endir, a masked mercenary who slays troublesome monsters for cash. A mysterious soldier approaches him and gives him another job: to assassinate a woman in a far-off village who is about to strike out on a pilgrimage to stop the recent swell of powerful beasts in the land. In confronting her, you learn that she has to die in order to complete the ritual, and so you decide that, well, since she's going to die anyway, there's no point in killing her now, so you accompany her on her quest to the Last Lands. As you progress through your journey, you'll meet a colorful cast of characters, each one with different reasons for joining your ever-increasing retinue. 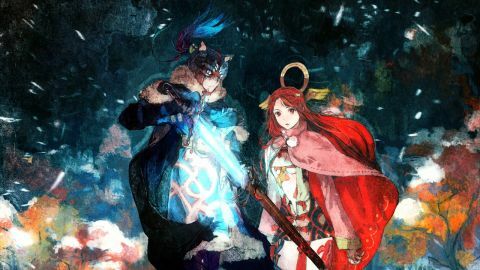 Parts of I Am Setsuna are a bit predictable (especially if you've played Final Fantasy 10, which shares more than a few themes and story beats), but its events are largely elevated by the characters who accompany you on your quest. You'll discover hidden agendas and wend through a few twists over the course of its 20-ish hour runtime, its simple-yet-effective visuals and music helping to sell its retro-minimalist intentions. I Am Setsuna looks like an HD-ified Dreamcast-era JRPG covered in pillowy snow, accompanied by the haunting solo piano compositions of Tomoki Miyoshi. In trying to nail a specific brand of game, on the surface, I Am Setsuna comes awfully close. Unfortunately, sorrow is the only emotion I Am Setsuna trades in, and as a result the experience can get monotonous. A single character and a few moments of levity aside, everyone is incredibly stone-faced and singularly focused on the mission to get Setsuna to the Last Lands to complete her quest. At first, the lush snow-covered forests, villages, and ice caves look impressive, but after a dozen hours of wandering between areas, it all starts to look samey and it becomes much easier to notice the reused assets (including entire building interiors) and palette-swapped enemies in later areas. This feeling is greatly exacerbated by the poor dungeon design (a series of mostly-linear crawls peppered by enemy encounters and the occasional branch with a treasure waiting at the end) and the intermittent backtracking you'll have to do throughout the story. As a result, I Am Setsuna feels like it could have done with some editing to keep its smaller, more focused narrative from running out of steam too early. Of course, one cannot describe I Am Setsuna's turn-based combat without invoking the name of the SNES classic Chrono Trigger, especially considering Square itself is keen to help make the connection for you - heck, one of your abilities is called X-Strike, ripped directly from the SNES classic. Functionally, it works very similarly: you engage in 'active time battles' (Square's name for its blend of turn-based and real-time combat that it's used since Final Fantasy 4), where you wait for a bar to fill up before you can make your chosen character attack. Like Chrono Trigger, you can elect to wait until one (or both) of your teammates' bars fill up as well so you can activate combined abilities, which tend to do more damage and inflict special status effects that regular attacks don't. You also have a secondary gauge which, when filled, allows you to activate special abilities when you press a button with specific timing, a la Paper Mario. On paper this sounds fine, but in practice, the whole thing is kind of a mess. For one, characters’ abilities aren't tied to their level, but rather equipped via items you find or craft called Spiritnite. Which abilities you have equipped determines which combo attacks you have available at a given time, and it's really hard to tell which abilities are tied to which combo attack without wading through loads of confusing menu screens and trial and error. The same goes for equippable Talismans, which offer stat bonuses and other abilities, but don't explain whether one Talisman is actually stronger or more useful than another. Special battle conditions called Singularities can swing momentum in your direction by giving you surprise buffs in battle, and Fluxes can help upgrade and transform equipped Spiritnite - but I couldn't tell you how to make any of that stuff actually happen, as even the in-game help screen mentions that their "true cause is unknown". The actual act of battling is much easier to understand, but once you figure out a strategy that works, there's very little reason to switch it up. For example, I found a combination of Spiritnite for my lead Endir and my swordsman buddy Ndir that gave us a huge, room-clearing attack at a cost of 15 MP per person. Once I discovered this ability, I used it in 95% of the battles I came across because it reliably killed every single monster within the first turn - and by the time I ran out of MP, my characters would level up, instantly filling up my health and magic. Combat became a joke, save for a few boss battles, and when you combine that with the monotony from its one-dimensional dungeon design, large portions of I Am Setsuna transform into an unintentional slog. It's a real bummer, because I Am Setsuna's heart is in the right place. It's got lovely music, its simplistic visuals have a real flair, and its attempts at evoking both a specific mood and gameplay style are admirable. But all the heart in the world doesn't matter if you have no soul, and I Am Setsuna's soul is painfully absent.